Would you like to be able to shop for clothes, cameras, computers, televisions, jewelry and hundreds of other items now and pay for them off over time? With Fingerhut Credit account issued by WebBank, you could get a line of credit to make purchases from Fingerhut online catalog. Financing is available to everyone, regardless of credit history. The WebBank/Fingerhut Credit Account is a credit account from WebBank that allows you to buy items from the Fingerhut print or online catalog and pay them off over time. Even if your credit is less than perfect, you could still qualify. Who can get it: Anyone can open a WebBank/Fingerhut Credit Account. Even if you have credit you may be approved instantly. In order to build buying power with Fingerhut and improve your credit score, you need to show that you can handle the account responsibly. This card gives you the opportunity to show that you can make purchases and pay off the balance over time. Why you should apply: There are several major benefits of opening a WebBank/Fingerhut Credit Account. Approval is fast for almost everyone who applies. Even if your credit is not perfect, you could get a WebBank/Fingerhut Credit Account. 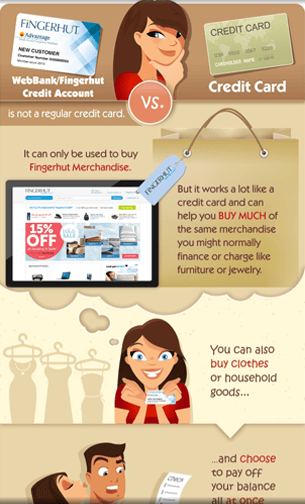 Although the WebBank/Fingerhut Credit Account is not a traditional credit card, you can still buy everything from clothing to electronics through their online or paper catalog of over 450,000 items. When you make purchases and pay them off, your payment activity may be reported to the major credit bureaus and your credit score may improve. Your credit limit can be increased when you demonstrate responsible purchase and payment behavior. If you make a late payment, you’ll be charged a late payment fee. If you pay less than your full balance each month, your purchases will accrue interest. So even though the Fingerhut website advertises low monthly payments it isn’t a good idea to be tempted to let a balance revolve from one month to the next. If you do, you will end up paying a hefty amount in interest charges. Instead, pay off your balance in full every month. That way you will only pay for what you actually buy. Why does the Fingerhut site list a price per month for each product?